I came across this requirement when content editors are allowed to create/edit forms in the Form Designer but only some of them are allowed to view Form Reports of specific forms. I came up with a naming convention for the role. 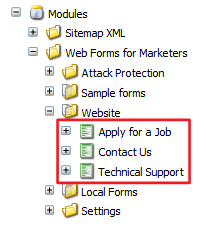 Basically, when you create a form, you need to create a role in a specific format. 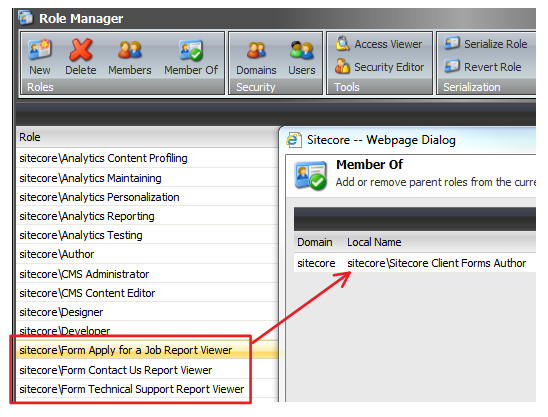 To control the access to Form Report dynamically, I had to override the Form Reports button. This is to check if the current user is in the role that is allowed to view the report of the current form. That is just to disable to button. If users try to access the Form Reports from some other ways i.e. Form Reports from the start menu, we need to secure the report page as well. So, I added the role checking in the FormDataViewerPage itself. Now, if you select the form that you don’t have access, you will see the blank report. When working with other developers in the team, there might be some configuration differences such as dataFolder (in web.config). Also, when moving from environment to another environment (dev, QA, staging), there will be a list of configurations you have to change. Ideally, this could be done using continuous integration and automatic deployment. However, if you don’t have that and you would like to store all configurations of all environments into the source control, you can utilize TDS using the following steps. You can also use TDS to deploy files and items to different environment. This will be a project to store environment specific setting and we will be using TDS to deploy these setting to any environment we want. Even though we’re not going to use TDS to deploy to production environment, we might want to keep production configurations in the source control so that at least we have a copy of production configurations in case we need them. How do we set TDS to deploy to each environment? Next, how do we do the same thing in Dev and Staging environments? Notice that all project files are changed. Now a new mode Dev-Debug is added to all project files. If you’re interested, you can use a file comparison tool such as WinMerge or BeyondCompare to see the changes. 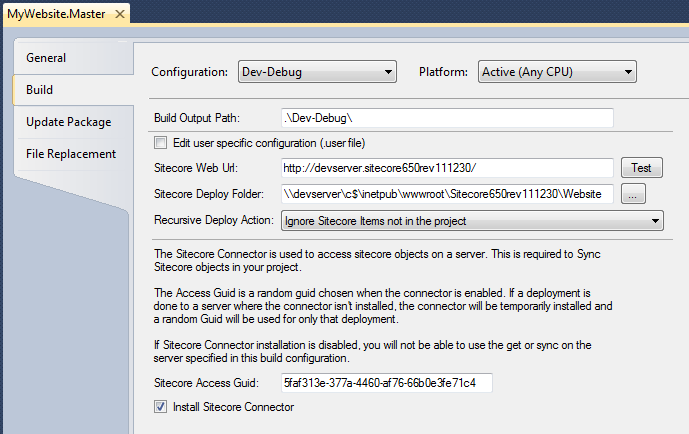 VERY IMPORTANT NOTE: we should use different Sitecore Access Guid for each environment to ensure we can’t accidentally deploy to wrong environment. In MyWebsite.Core, you can also do the same thing in both Debug and Release modes except the File Replacement tab, just leave it blank. 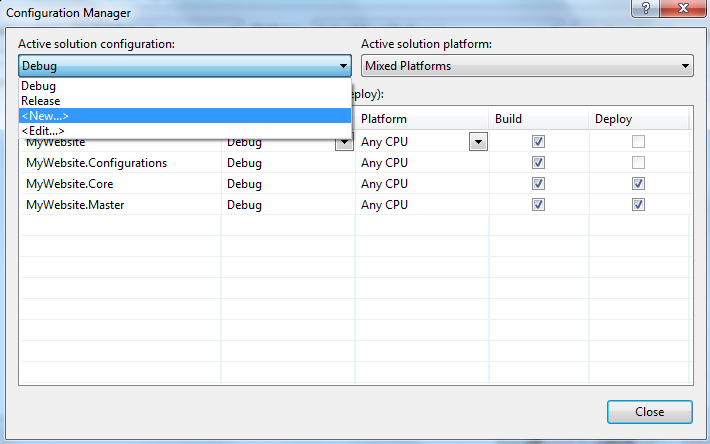 Now you should be able use Deploy functionality in TDS to deploy to development server. 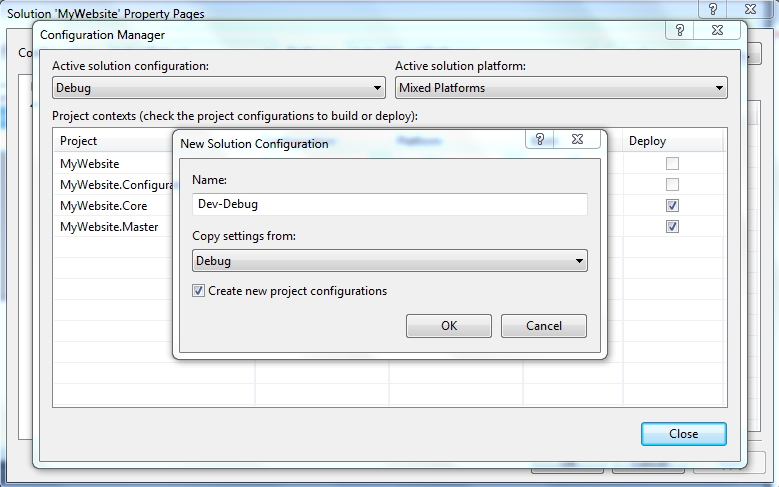 Note that you have to select Dev-Debug mode in Visual Studio before clicking Deploy. In Staging and Production, you should only have build in Release mode by having Staging-Release and Production-Release. Follow the same steps to setup. 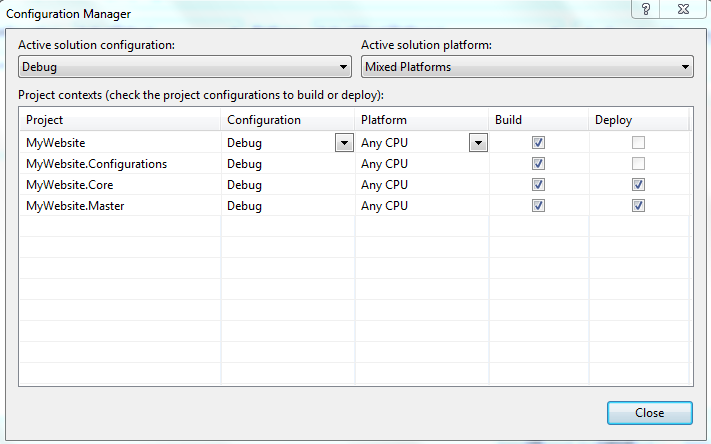 The following setup is to demonstrate how I store the configurations in this project in all environments. Last, double check if you setup things correctly. Go through all TDS project files and .user files. In .user file, there should only be Local configuration. Each developer has own .user file with different settings. Set the properties of all TDS projects. Make sure to check Edit User Specific Configuration (.user file) so that it only belongs to you. 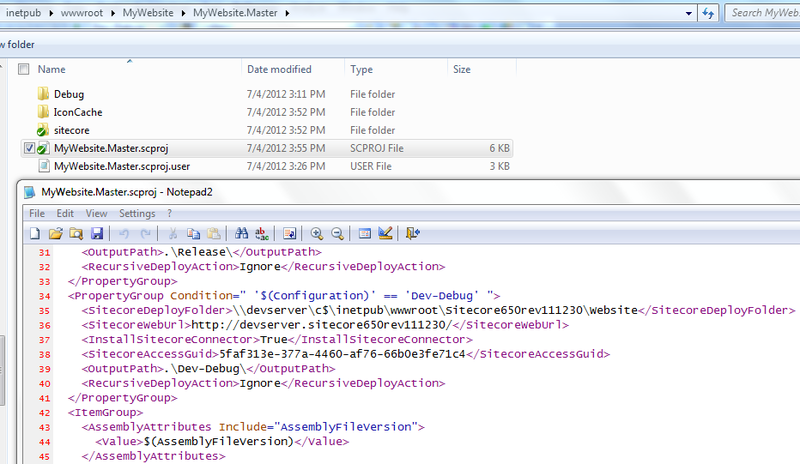 I have a problem with my Sitecore website cannot display my custom error page i.e. 404. The custom error page works correctly in my local development machine but not on the server. After trying to post a fresh installation of Sitecore website on the server, I found that the Sitecore error pages do not work on the server as well. In the default web.config, there is a setting of ItemNotFoundUrl. 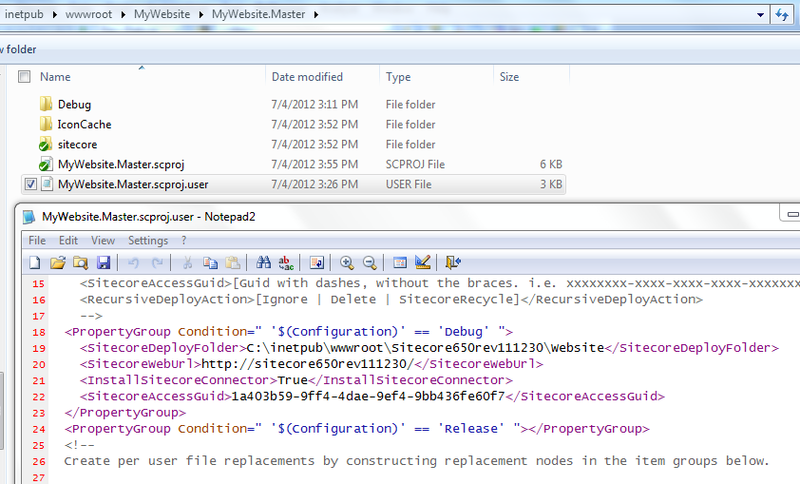 Now Sitecore error pages show up correctly. I know this is a problem about GZip compression. 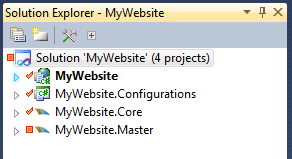 So, I unchecked Enable static content compression in IIS. And, the problem goes away. However, this is NOT the ideal solution because you don’t utilize the compression. 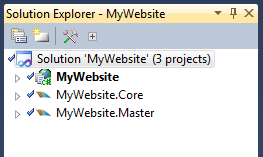 But, I want all extensions to go through Sitecore since I need to capture all other extensions such as .html, .php, etc from the old site so that I can 301 redirect properly through my custom redirect module. This is the process that I take when deploying changes or new features to load-balanced content delivery servers. 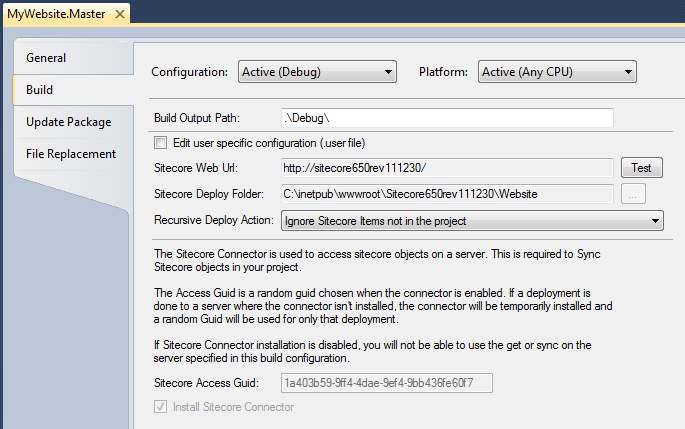 The following is the basic diagram showing a normal Sitecore setup with multiple content delivery servers. 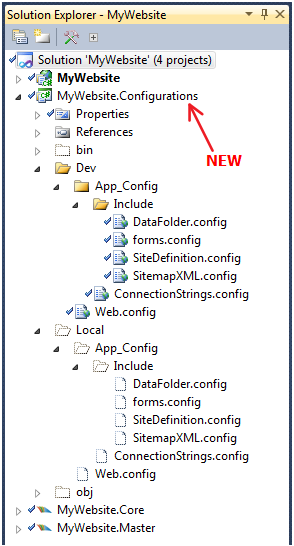 The problem I have found when deploying a new feature to production environment is that sometimes the new feature requires both files and item changes (i.e. new data template, new fields, new presentation) to be deployed at the same time. 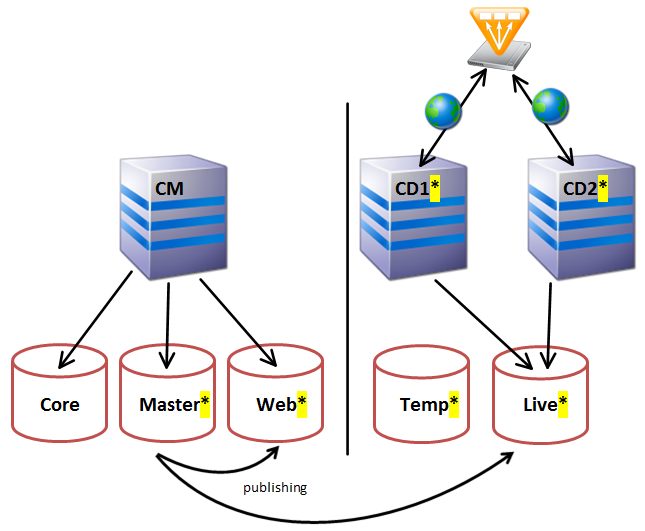 I can take CD1 out of the load balancer and deploy files to CD1 but there is no way to avoid undisruptive deployment to both CD servers if I need to publish something from Master to Live database. The followings are deployment steps that I take (Though, there might be some other ways to accomplish the same goal). Make sure everyone is in content freeze mode. 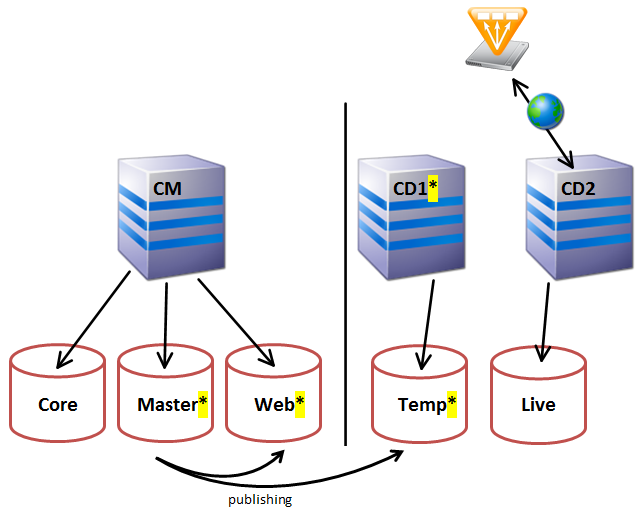 Create a Temp database that will be used for undisruptive deployment. Add a new publishing target “Temp” which is identical to “Live” (restored from Live backup after content freeze). 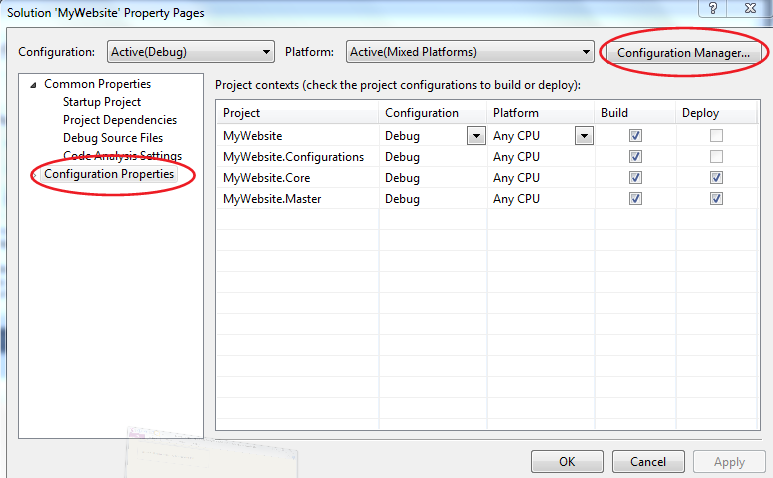 Enable Temp publishing target and disable Live publishing target. Start the deployment to CD1 by taking CD1 out of load balancing. Only CD2 is available to public via the load balancer. Change the connectionstring of CD1 to Temp database. 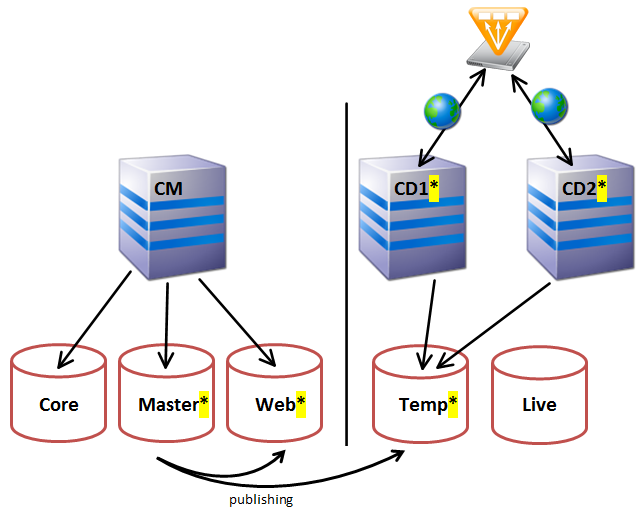 Deploy the changed files to CD1 and publish the changes from Master to Temp. Verify if everything works correctly on CD1. Once everything works on CD1, bring CD1 live and take CD2 out of load balancing. At this point, the new feature is available to public successfully. If there is anything wrong, we can easily direct the load balancer to CD2. Next step, we’re going to deploy the same change to CD2 by deploying the files to CD2 and point CD2 to Temp database. Once we verify if CD2 works correctly, we can add CD2 back into load balancing. Now we have completed the deployment. It depends on how you would approach this. You can leave everything as is. “Temp” database will now be production database. You can name the databases as “Live1” and “Live2” if this would make more sense. I personally want to keep everything clean. 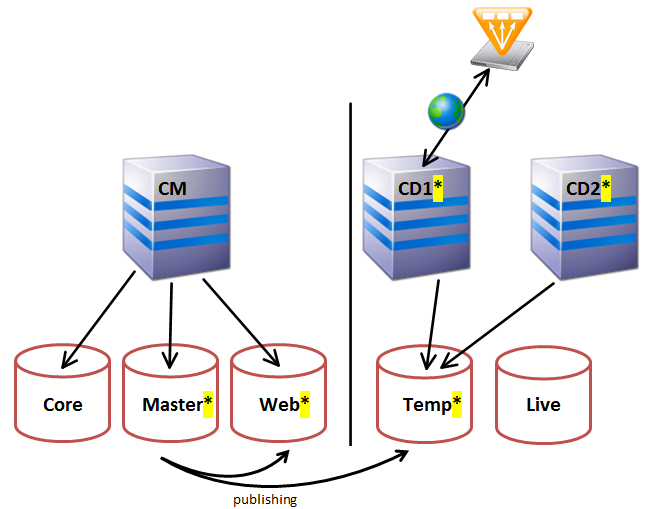 So, I would enable Live publishing target and publish everything to live database. Take CD1 out of load balancing and point the connectionstring to Live database. Verify CD1 again before bringing CD1 live and take CD2 out of load balancing. 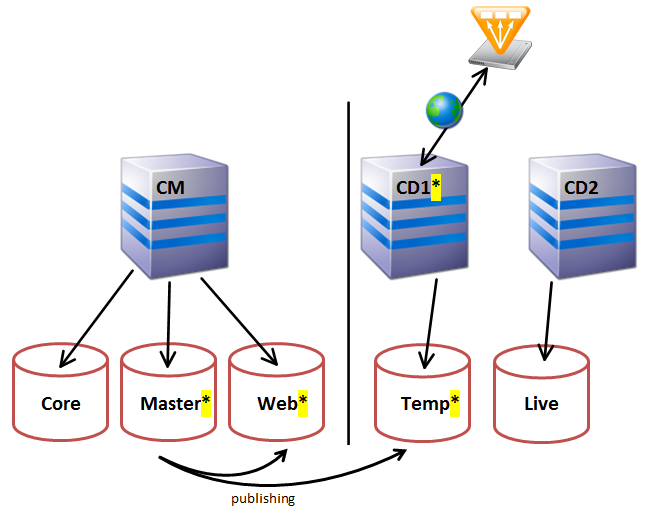 Change CD2 connectionstring to Live and verify CD2 before adding it back to load balancing. 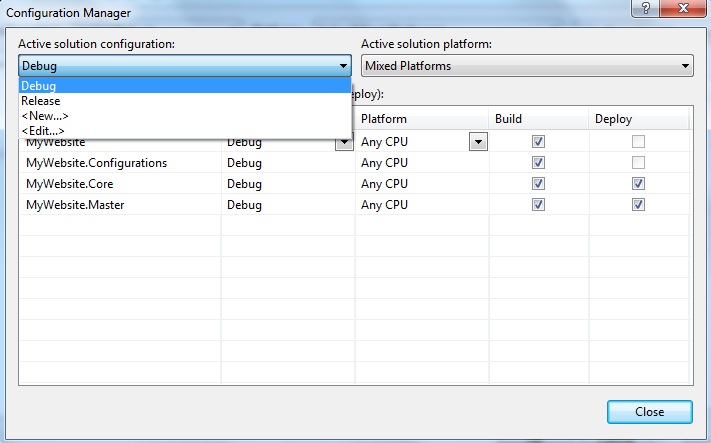 Enable Live publishing target and disable Temp publishing target. We can keep Temp database for future deployments. This deployment process is now complete. We can notify content authors to get back to Sitecore again. Even though XSLT is easy to write, it’s hard to debug and it’s more expensive when comparing to sublayout. Anyway, if you happen to write XSLT, be sure to do it efficiently. This will use xslt processor to select items that match the condition. It’s faster than the first one.